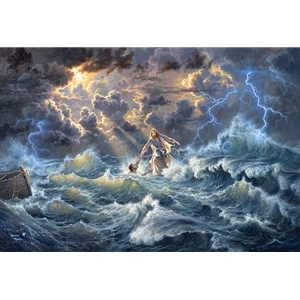 This painting is my third time depicting one of my favorite moments from the Bible when Jesus walked on the water in a terrifying storm and called Peter to come out of the disciple's boat and walk on the waves with Him. The story relates so well to all of our walks through life. As humans, we struggle with fears and doubts that try to choke out the love of Christ… a love that casts out fear. What do you do when you’ve taken your eyes off of Jesus’ outstretched arms and sunk in the waves of fear? How do you fix your life when you’ve messed up so bad that you’re sinking into the depths of the sea, beat by the wind and waves, and death is close at hand? The answer is simple. You can’t fix it, but Jesus can. Peter had only one option in that moment of panic... reach out to Jesus! Anything you do in your own strength to save yourself is futile. The Bible says “by grace are ye saved through faith; and that not of yourselves: it is the gift of God”. One of the names of God is Jehovah Moshi’ech, which means The Lord Your Savior. That's the message I wanted to convey in this painting! Our forgiving loving Savior is there to save you when you are in doubt and rescue you from your fears if you simply reach to Him! I hope this painting speaks to you and lifts your spirit with the knowledge deep inside that you don’t have to fear, for you are “Saved By Grace” through Jesus Christ, the everlasting and omnipotent Master of the waves!